alaTest ha recogido y analizado 18 comentarios relacionados al producto Nikon Travelite EX Binoculars. En promedio, la calificación para este producto es 4.7/5, al ser comparado con la calificación 4.3/5 de otros productos en la categoria Binoculares. Analizamos las valoraciones de los usuarios y los expertos, la edad del producto y demás factores. 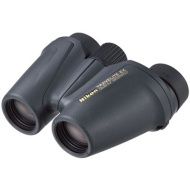 Comparado con otros Binoculares el Nikon Travelite EX Binoculars recibe una alaScore™ global de 89/100 = calidad muy buena. For their size the clearest binoculars I have ever used. My previous binocs were Nikon zooms, but who needs a zoom with such a clear image. The added complexity of zoom binoculars clearly reduces quality. This item was bought for a retirement present and it was greatly received and is being enjoyed by the recipient. Good grip. Comfortable to use (I wear glasses). Neat. Highly recommend. Yep cool....clarity ...light....feel good in your hands.....fit for purpose.